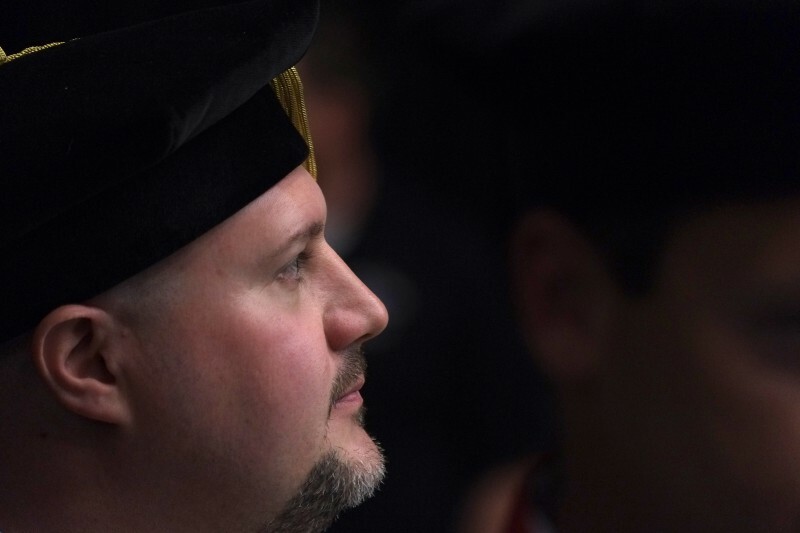 A graduate watches the procession into the 2013 Gardner-Webb University Commencement. On Monday, I was editing my student’s work from Gardner-Webb University’s three commencement ceremonies. It was an all day affair and kept me busy posting photos during the events. However, I was able to sneak out for a couple of minutes and shoot with a preproduction version of the Fujinon XF55-200 F3.5-F4.8 R LM OIS on my Fujifilm X-Pro1. Our gym is pretty dark and I was shooting at 1600 ISO. But, I was pleased with the results. This lens is sharp as can be and fairly responsive in a low light situation. 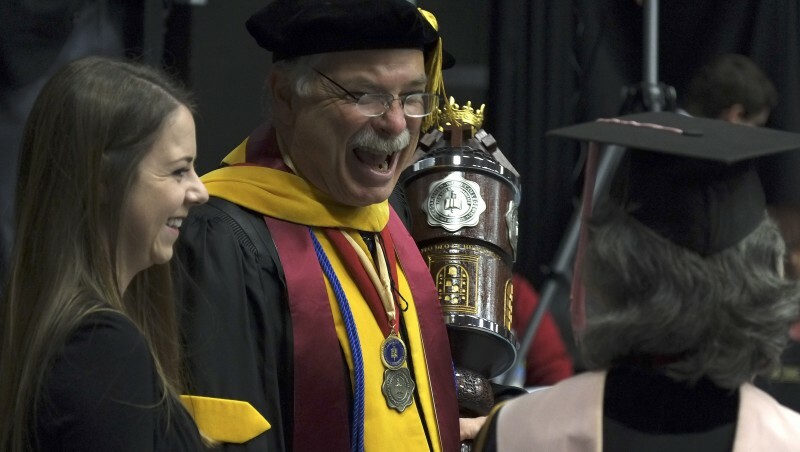 Dr. Tom Jones of the Natural Science Department prepares to lead the procession with the official mace. 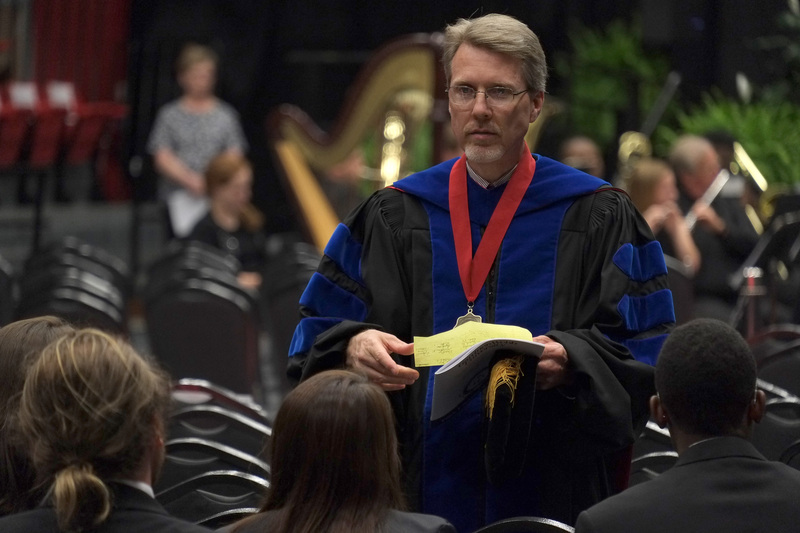 Dr. Paul Etter preps the choir for their performance at the Spring 2013 CGardner-Webb University Commencement. As I said in my earlier post, it has taken me some getting used to shooting with the EVF. I’m an OVF fan for my X-Pro1. That said, I feel like this lens really preformed well. I also found that the lens has a nice “bokeh”, something I look for in a lens. You can see it in the image I shot of my son cleaning our gutters earlier in the week. 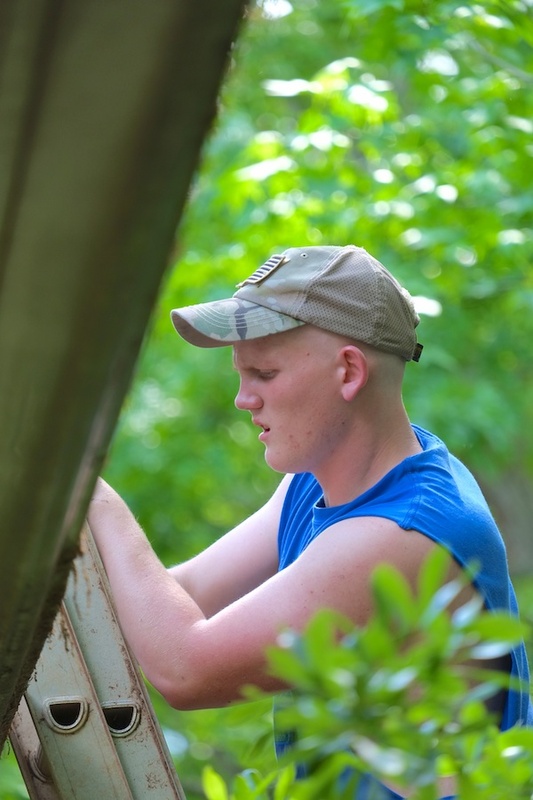 My son AJ cleaning our gutters. While I still had the lens, I tried to find some other subjects to test out the ability of this lens.I shot some scenics and an informal portrait before sending it off to the next photographer Fuji USA had scheduled to evaluate it. I’m normally a fixed focal length type of guy, but I’ve been using the Fujinon 18-55mm f/2.8-4 R OIS quite a bit as an everyday lens on my Fujifilm X-E1. I’m not going to say I’d use the XF55-200 a lot, but there certainly are times it would be nice to have it in the bag. I stopped on campus and began to look for some interesting subjects. 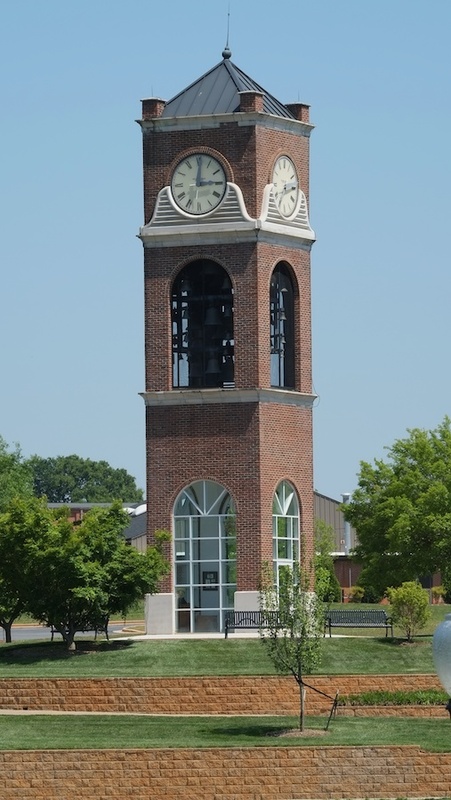 The clock tower on the campus at Gardner-Webb University, although not my favorite subject, was across the small lake and provided a nice travel-like subject. Still wanting to get in a few more images with the lens, I went down towards the Broad River and found a group who had been enjoying the day in the sun. Tanner was more than willing to pose with his dog Roxie for me. So my overall opinion of the lens is that I can’t wait for it. As I said earlier, I really enjoy primes, but the 55-200 zoom will find it’s way into my bag. 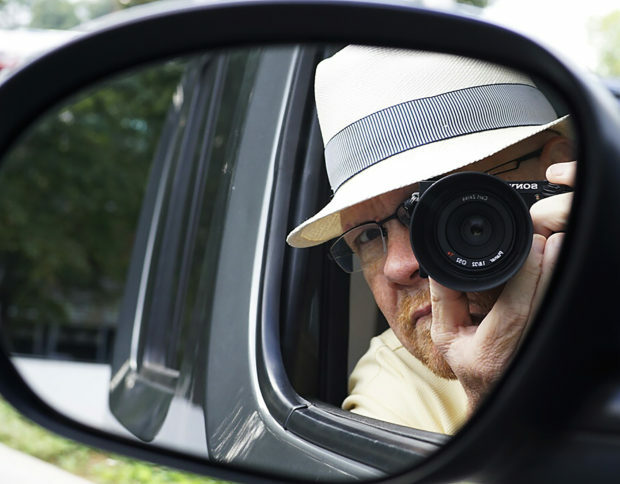 It provides a range of focal lengths that photographers need and yet it offers a professional quality lens. It may not be a blazing fast aperture, but it is certainly adequate, especially for the travel photographer or someone shooting in the studio who needs a longer focal length. I’m enjoying the new Fuji X Series cameras and lens. They are giving my back a rest and allowing me to capture moments without a large camera.